The #3 Oxford Yellow Jackets will host the #1 Pinson Valley Indians on Lamar Field in Oxford Friday night. This Class 6A Region 6 clash will bring one of the top offenses in the state and one of the best defenses in the state. Oxford has giving up only six points in four games this season. Yes only six points. That averages out to 1.5 points per game. Oxford has one of the best defensive lines in the state. For Pinson Valley, they have one of the best offenses and average 33.0 points a game in their four games this season. This is a big game for the winner because it could decide the region title. Pinson Valley (3-1, 2-0) bring in one of the top quarterbacks in the state. Bo Nix runs the offense and when its on it can put up a lot of offensive numbers. 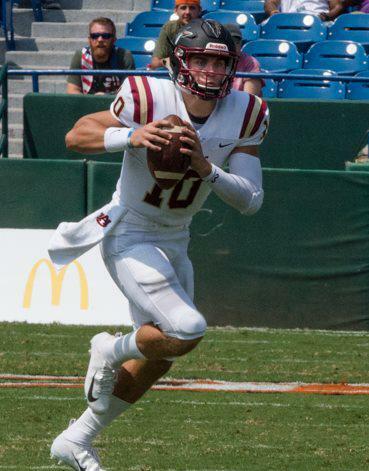 Last week, Nix completed 30-of-38 passing for 409 yards and three touchdowns. One of his top targets in that game was receiver Keyonteze Johnson who had 17 receptions for 247 yards and three touchdowns. Against Shades Valley, wide receiver Demarion Holloman had a breakout game catching five passes for 100 yards and three touchdowns in the third game of the season. Tye Pouncey and Geordan Pollard are other solid receivers for the Indians. Running back Mike Sharp will carry the running load for Pinson Valley. The Indians defense is led by Rhassan Christian. Christian holds an offer from Texas-San Antonio and should get more as the season goes. Defensive stoppers Dorian Henderson, James Perkins, and Gabe Hamby can get to the quarterback at any time. Oxford (4-0, 1-0) comes off a 62-0 whopping of Charles Henderson last week. Trey Higgins leads the Yellow Jackets offense at quarterback and does a good job of running the football or passing it down the field. He looks to be a better runner than passer right now coming in as a sophomore QB. Tyetus Smith-Lindsey leads the Oxford run game. "Ty is a tough runner that goes between the tackles like he is a 220-pound running back," said Yellow Jackets head coach Ryan Herring. "He stands at 150-pounds but he's a good runner." At receiver, sophomore Rok Taylor is getting better with experience. Taylor holds an offer from UAB. X'Zavian Britt, Davion Ball and tight end Larry Melton round out the receivers for the Yellow Jackets. The #1 lineman in the state Clay Webb is playing offensive guard this year. In the past, Webb has played some tackle and will be a problem for the Pinson Valley defensive lineman. The senior lineman has offers from Alabama, Auburn and a host of other SEC schools. Georgia is looking to make a hard push as the season goes. The defensive line is very talented for Oxford. Jaylen Swain, Kristin Booth and Octavious Adair bring bring pressure all game long with a very high motor for each of them. "We work hard on defense," added Herring. "Everyone plays their role. Our defensive line is very, very fast. Our defensive line is probably faster than our secondary." Pinson Valley has not given up a sack with Nix and his quick release. The key in the game is if the Pinson Valley offensive line can give Nix time to throw or will he be rushed in the pocket all night by the Oxford defensive line. Oxford on offense needs to find more balance in their passing game to be successful against good teams like they will see Friday night.